Whether they’re long, flared, or fitted, dresses have evolved over the years while maintaining their place on the top shelf of women’s wardrobes. Follow our guide and discover the main types of dresses, as well as our tips on how to wear them. Let’s get started! Often associated with major events like prom, weddings, or galas, long dresses are increasingly worn in casual contexts. Becoming an icon of hippie fashion in the 1960s, maxi dresses that skim the ankle haven't left our closets since! They now come in various styles, ranging from chic mermaid dresses to cute and colourful summer dresses. One of the most iconic styles is without a doubt the slip dress. Inspired by women's lingerie, it features a very sleek cut, light and silky fabric, and simple spaghetti straps. While it was first worn in the 1920s, it had to wait until the early '90s to rise to popularity with the help of top model, Kate Moss, who made the dress her trademark. We still remember the completely transparent maxi dress that she wore in 1993 to a party organized by a modeling agency in London! This event made a name for Moss and the slip dress in the fashion world. The popular piece was then produced in every possible length. Among some of the most legendary gala dresses are the famous black turtleneck dress worn by Céline Dion to the 1998 Oscars that was beautifully accessorized by the precious Heart of the Ocean necklace, and the pink Ralph Lauren dress worn by Gwyneth Paltrow to the Oscars in 1999 when she was nominated for best actress for the film Shakespeare in Love. It's also impossible not to mention the daring Versace dress with the provocative plunging neckline worn by Jennifer Lopez to the Grammys in 2000. Wondering how to wear long dresses? Think that they only look good on a tall and slim body type? Think again! It’s just a question of finding the fabric and cut that flatters you best. Choose one that’s cinched and form-fitting to accentuate your waist, or one that’s drapey with fluid fabric for a boho style that’s Grecian goddess-worthy. Whether straight or sculptural, it will make you look tall, an illusion you can play into with a pretty pair of pumps! Whether we're talking knee length dresses or mini dresses, the most popular dresses to date are little black dresses. Their main asset? Their versatility! Since they often come in styles and cuts that are more on the simple side, it's—you guessed it—their chic and all-purpose black hue that steals the show. Worn by young girls and widows as far back as the 14th-century, they were at the time considered an outfit of convenience. Everything changed in 1926 and they became a style statement in their own right thanks to the now famous designer, Coco Chanel. Women immediately began snapping them up, prompting many designers and creators to make their own versions. Even today, the little black dress remains an iconic Chanel piece and is now a major fashion must. Among the most sought-after short dresses are cocktail dresses. Often made of luxurious fabrics like brocade, chiffon, crepe, satin, or taffeta, the cocktail dress is certainly the most festive frock! It's the perfect choice for most formal events. Speaking of dresses that hit above the knee, we also have the wrap dress (a speciality of Belgian-born American designer Diane Von Furstenberg), the sheath dress, the suit dress, the strapless dress, the A-line dress, and the shirtdress, just to name a few. Being one of the most versatile pieces, short dresses don’t follow any strict rules when it comes to adding accessories. They go well with sandals, ballet flats, pretty boots, and high-heels depending on the context and style of the garment. Here, the sky is the limit! After World War II is when midi lengths really rose to popularity in the fashion world. Dior literally stole the spotlight in 1947 with his first “new look” collection. Full midi skirts and cinched waists added a fresh feel and introduced an ultrafeminine silhouette to clothing after an era of hostility and restraint. Instead of dazzling for decades, midi dresses were quickly dethroned by the arrival of the miniskirt in the ‘60s. This piece was more revealing and allowed the women of the time, who’d been long-supressed by the fashions of the past, to show off their legs as they pleased. Characterized by a sensible, modest length that hits below the knee and could go as low as the mid-calf, the midi dress has since regained its former glory. Today, it is in demand and synonymous with class and elegance. It's not surprising that it's a top choice for the British royalty! 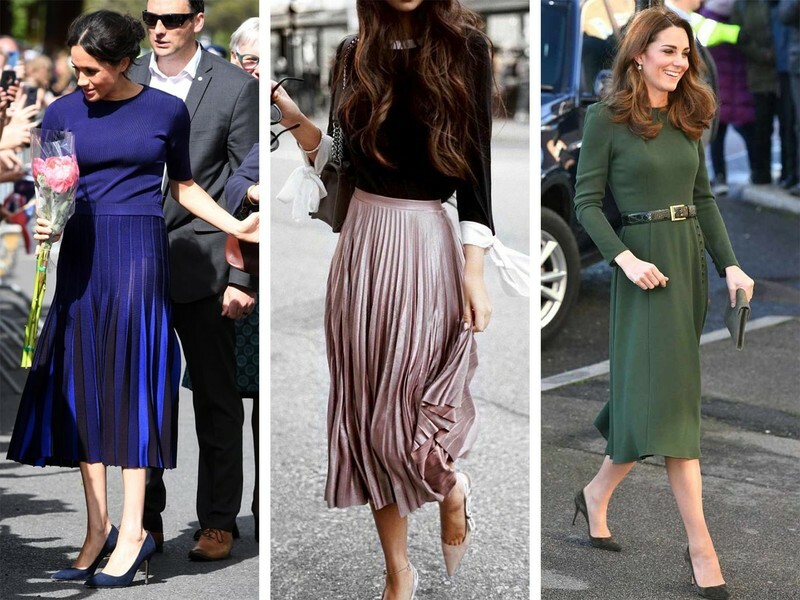 When duchesses Kate Middleton and Meghan Markle don a midi, it's a sure-fire sign that this dress is the epitome of sophistication. Wondering how to wear a midi? Due to its peculiar length, this dress might seem a difficult challenge. However, midi dresses are really made for everyone. You just have to follow a few certain rules. To balance the length, wear a style that has a high waist, or use a belt to accentuate the waistline. High-heel shoes also allow you to elongate your silhouette and show it off at its best. No matter which dress you choose, wear it with confidence! The attitude of the woman wearing a dress is as important as the garment itself. Wear it your way and you’re sure to slay.